When I see Max Factory’s figmas...I usually see a nice box. But its the contents that are important, right? Only 1 stand, 2 extra hands in different poses and extra ball joints. I have no idea how to use that tiny translucent part because the instructions hardly says anything. I suppose 3 pairs of hands is enough for the majority of poses and its according to the price. The shoulder looks a little hunched but by adjusting the head and neck, it would look normal. 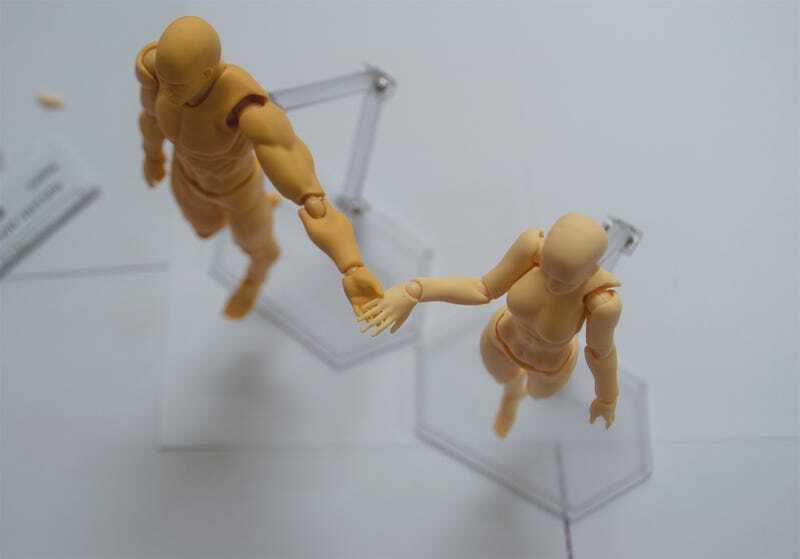 The Male figma has some parts that are easy to move and the others are hard to move. This makes it into some puzzle solving game that eventually I would know by instinct on how to move the Male. But there was definitely the feeling of frustration for awhile...Maybe I just have a bad product? Sticking the stand into him was another chore that ended up with a mostly unnoticeable scratch on his back. Price: About 28 to nearly 30 USD depending on where you buy it. Disclaimer: Both figurines were bought with my own money. You may use the images for your website or video but please put in the credits and don’t forget to link in where you can buy the products. Edit: 2nd part the review is UP!